Hi, everyone! 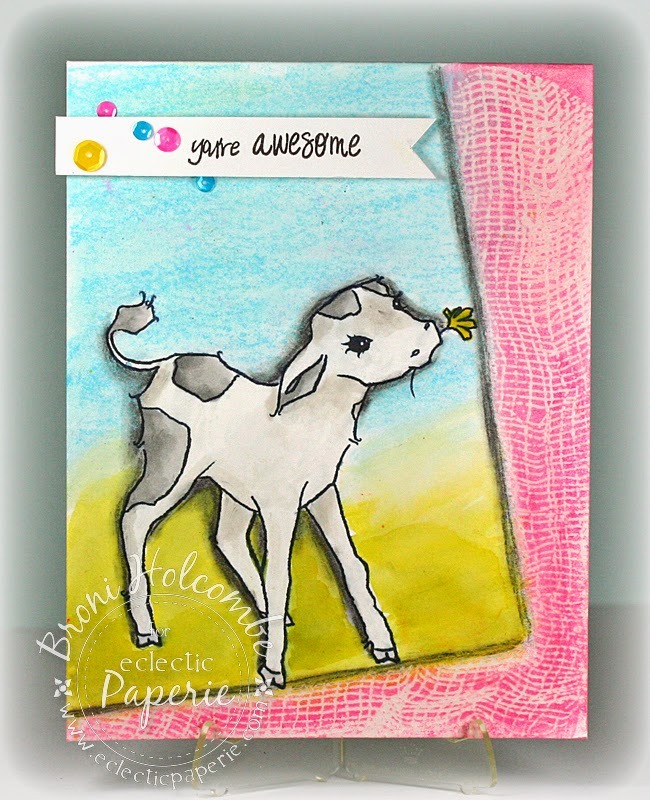 It's Broni here with you today and I'd like to show you how I made my Sweet Cow one-layer card. I used a digital stamp image (from A Day For Daisies), and printed him on the bottom left side of a piece of mixed media paper first. Then I cut the paper in half length-wise, and folded it in half. I had my card base ready. 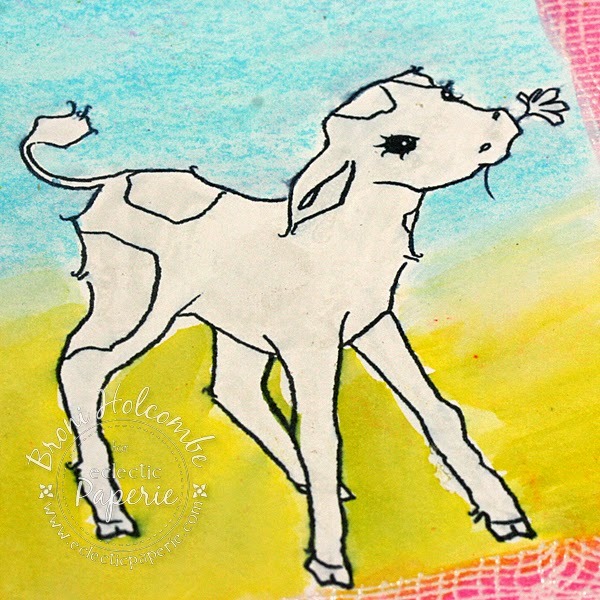 I took a piece of copy paper and laid it askew on top of my cow, taping it to my craft sheet to hold it in place. 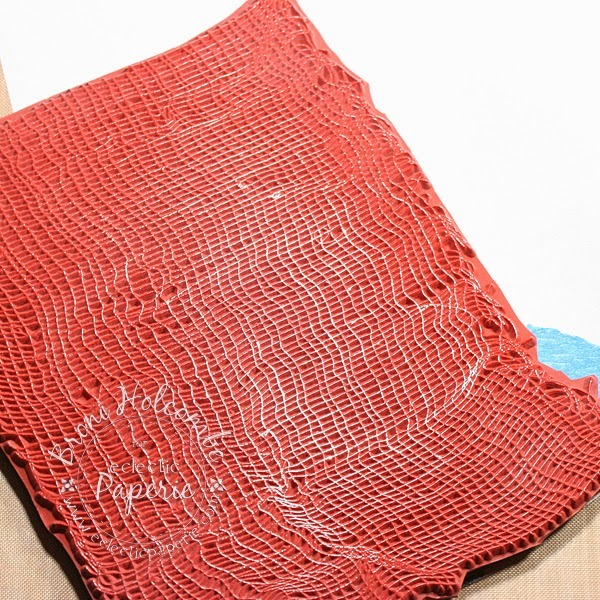 I inked up an old cheesecloth background stamp that I had using Versamark. 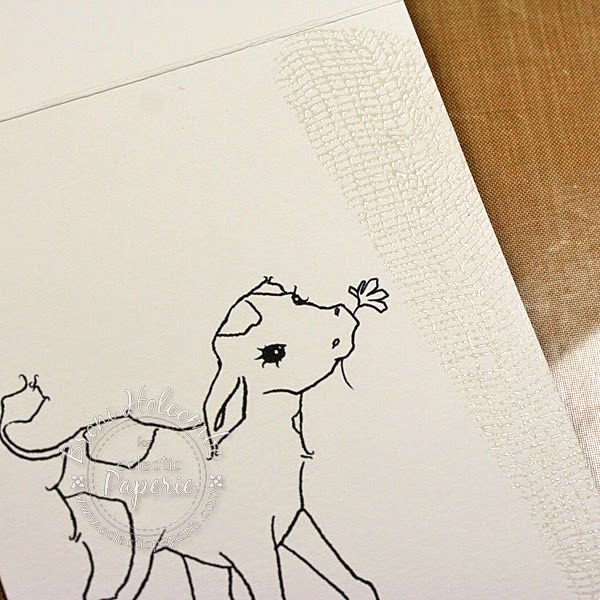 Then I stamped it onto my card front and embossed with clear embossing powder and my Ranger heat tool. 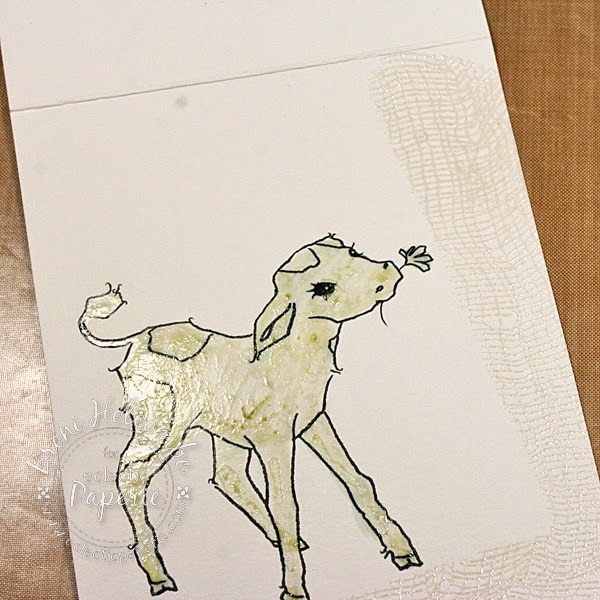 Next, I made my sweet little cow look like he was very sick by painting some art masking fluid onto him. When it dries it protects him, so that I can prepare my entire background and not worry about having to be careful of getting color on him. I then used my Watermelon and Snow Cone colors from my Tropical gelatos to create the sky and the cheesecloth frame. You can see where I started rubbing the Snow Cone color in with my finger in this photo. I used my finger and a water brush to blend and soften the colors. 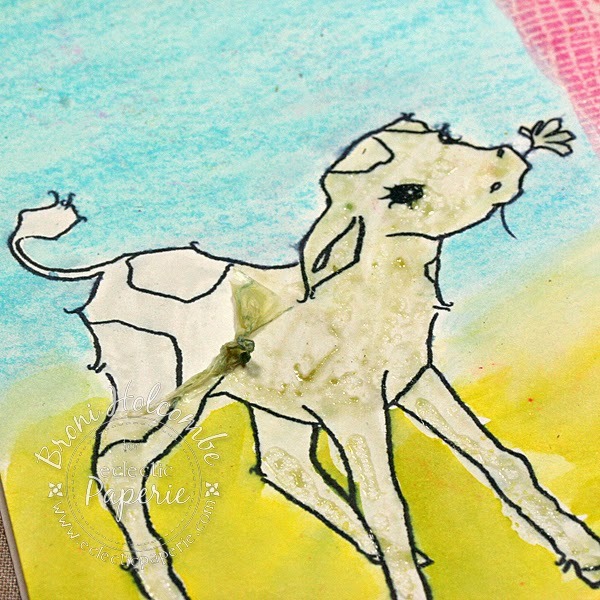 Then I used some Crushed Olive Distress ink to create the grass. 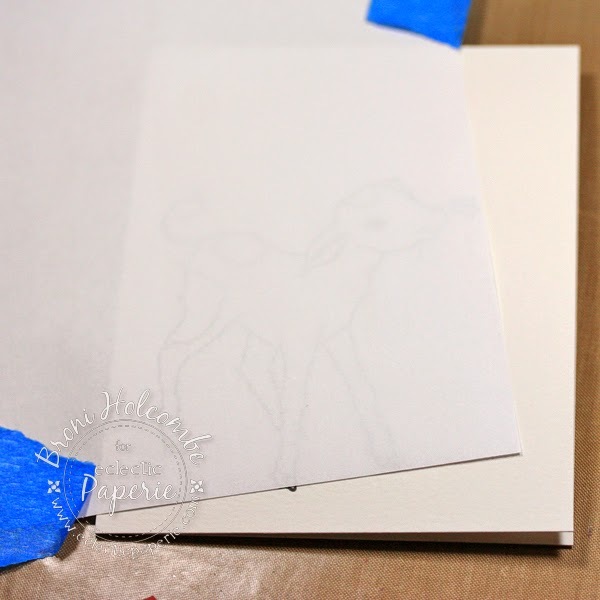 Now it was time to remove the masking fluid. It's usually pretty easy to remove just by rubbing your finger over an edge to get it started. Then you just peel it. If I have an issue removing it from a smaller spot, I just use an eraser to rub over it. Here's how he looked with it removed. 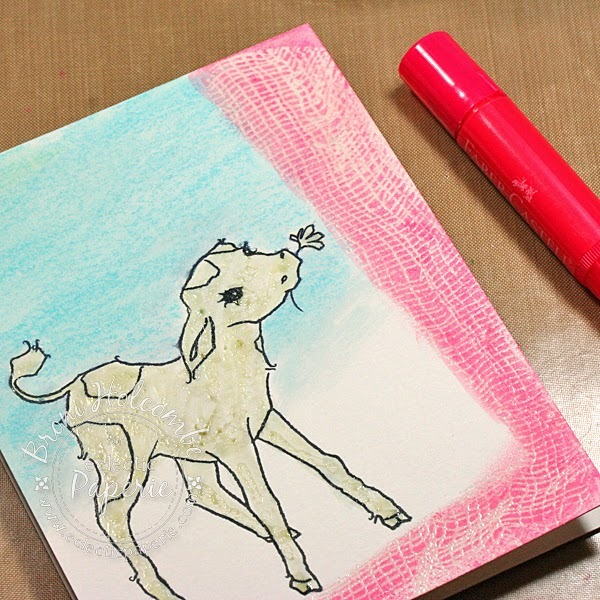 Finally, I colored my Sweet Cow with my Copic markers. I shaded around him and the frame using my black Stabilo pencil. I also used a blending stump to soften the black. Lastly I added a sentiment on a little flag banner and popped it up on some foam mounting tape. The sequins were my finishing touch. I hope you like it! And I appreciate your taking the time to stop by for a visit! 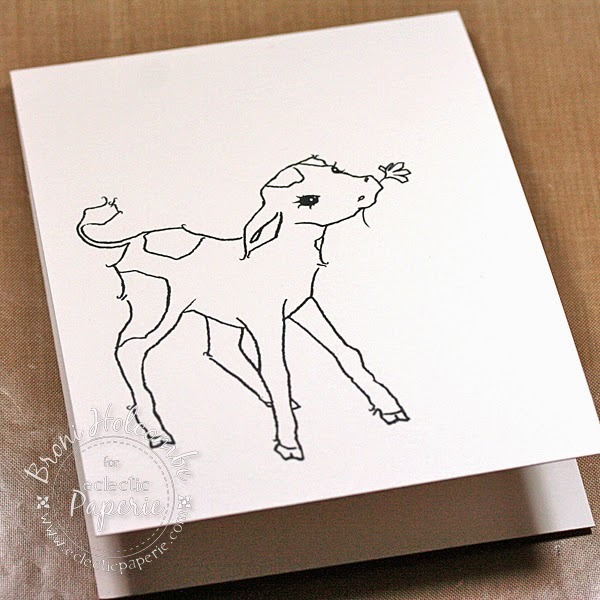 what a sweet little calf Broni - love the cheesecloth stamping and fun technique with that liquid masking! Oh my gosh, how stinkin' cute is that?! LOVE that image and the background w/ the cheesecloth is genius!!! Really CUTE, Broni! LOVE your steps! Clever way to create dimension in a single layer! Oh he is such a cutie calf... Love him. You really made a great card. 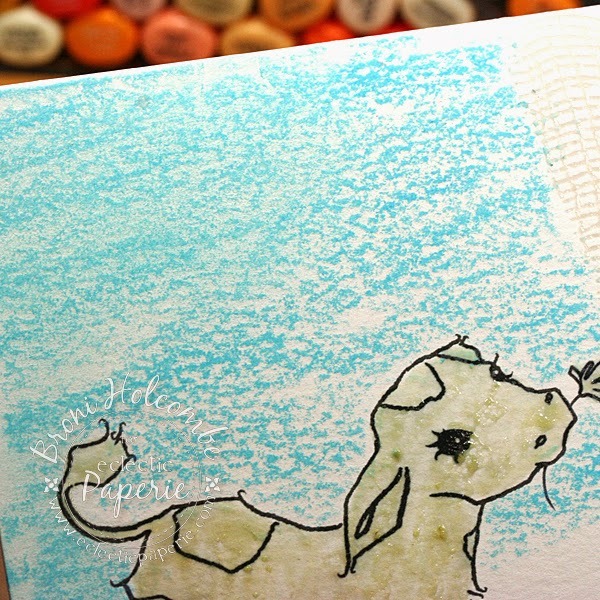 Great idea using the cheesecloth stamp as background.